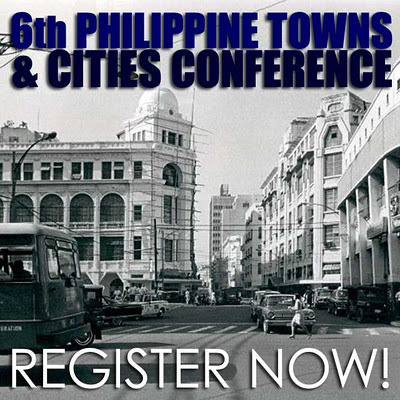 The Heritage Conservation Society, Urban Partnerships Foundation (UPF), Philippine Institute of Environmental Planners (PIEP), the City Government of Manila, the Manila Historical and Heritage Commission are holding the 6th Philippine Towns & Cities Conference on November 4, 2011 from 8am to 5pm at the Far Eastern University (FEU) Auditorium, located at Morayta (Nicanor Reyes Sr. Avenue), Manila. This conference encourages architects, urban planners, property developers, policy makers, national and local government officials, engineers, planners, building officials and tourism officers, heritage property owners, and all those interested in heritage to attend. The urban revitalization of old city centers and historic districts is the new big thing for urban planning, property developers and local government policy. This would be a good opportunity for everyone to get insights on opportunities in the revitalization of historic districts. Conference fess are Php1000 for both government and private participants; and Php200 for undergraduate students with IDs. For more information, contact Dorie Soriano or Luz Regalado of the Heritage Conservation Society at (632) 5466367, (632) 3534494, +63.917.8668853, +63.906.2625631 or e-mail hcs_secretariat@yahoo.com. You can also check out the Event Page in Facebook for further updates.